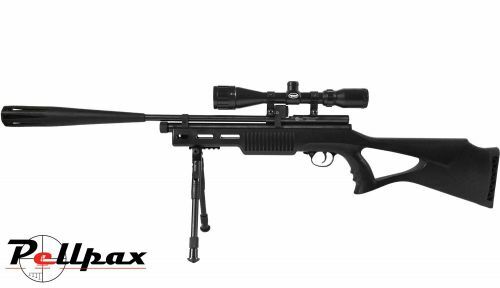 This model of the fantastic Rat Sniper air rifle comes in a synthetic tactical shot complete with a new multi shot bolt action system makes it ideal for hunting and target shooting. The synthetic stock includes a thumbhole grip with a contoured pistol grip for a comfortable and strong hold, along with a lined pattern to the forestock which increases grip in this area. The front of the stock includes mounts for the included bipod for extra stability on long range shots. The precision steel rifled barrel is very accurate and is fitted with a sound moderator to reduce the muzzle report when the pellet leaves the barrel. Pellets are loaded through the easy to use bolt action system, which now incorporates a multishot system for quick reloading in case you need a quick follow up shot. Included in the price is the air rifle, 4x32 Scope and Mounts, Bipod, and Sound Moderator. Add this item to your basket & spend an extra £260.01 to apply for finance.